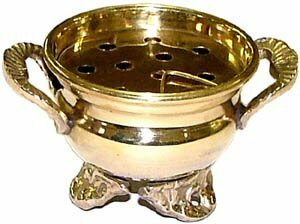 Brass Cauldron Burner For Resin Incense is made of brass and features a charcoal screen. It can be used for cone incense or for charcoal incense. This Small Brass Cauldron Incense Burner measures 2 inches tall and 3.5 inches wide.